I am thrilled to have my critique partner from the MiGs, Debbie Ridpath Ohi, chatting with us here at Chocolate for Inspiration. I’ve known Debbie for a number of years and I’ve had the chance to read her middle grade and picture books. She is incredibly talented and I can’t wait to see all of other projects come out to the light of day over the next few years. Me: There is so much fun and humor in your illustrations. What springboards you to come up with these creative ideas? Debbie: Thanks, Christy! I draw a lot, just for the fun of it, and I think that helps a great deal. If I only drew for work-related projects, I suspect my illustrations would tighten up and lose much of the energy that people seem to like. So I try to sketch and doodle digitally and on paper as much as I can. I admit it was an adjustment at first. Once I started working on I’M BORED, my doodling went way down at first because I figured I needed to put the time into workstuff instead…but then I found this had a negative influence on my workstuff. Once I started drawing for fun again on the side, things got better again. Now I’m thinking I should starting doing more of the same for my writing as well. I used to keep a private daily journal, just for random thoughts, and I think I’ll start it up again. Me: How do you look at a story from an illustrator’s perspective? Debbie: That’s an interesting question, mainly because I’ve always looked at stories visually when I’m reading. However, working on I’M BORED as well as my new picture book project for Simon & Schuster BFYR has certainly started me thinking a lot more about the picture book reader experience. There are so many aspiring picture book writers and illustrators out there who think that it’s just a matter of writing the story and then adding pictures. It’s so much more, however. Writing picture books is HARD. Or rather, writing a good picture book that stands out in the marketplace and is appealing to young people (rather than grown-ups who are used to the classic type of picture books from the past) is hard. It’s a challenging but ultimately immensely satisfying process. Me: And the most important question, what’s your favorite chocolate? Debbie: Good quality dark chocolate. A fellow chocolate lover! Yay! Thank you so much Debbie for hanging out with us! 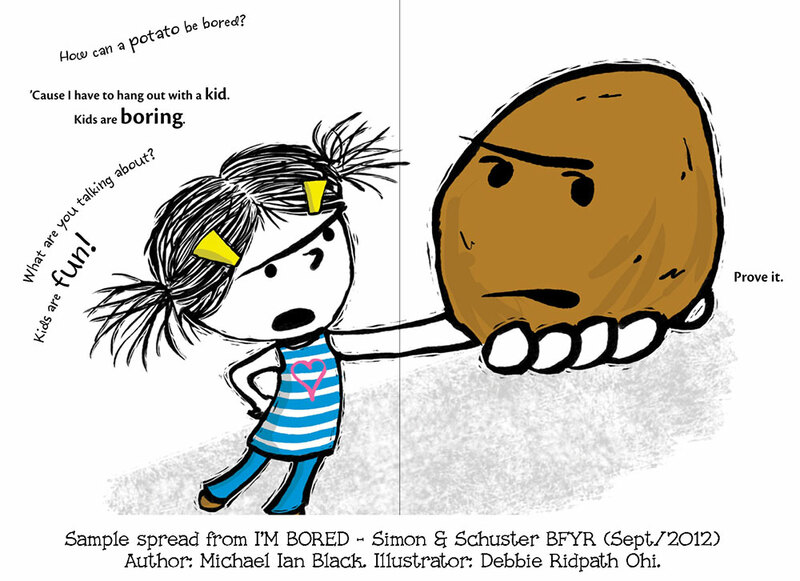 Debbie and Simon and Schuster have also offered to give away a copy of I’M BORED! Just comment in the section below. Get an extra entry for tweeting, blogging or mentioning this interview on Facebook. Just let me know in the comments section! Contest open internationally until Sept. 19th. 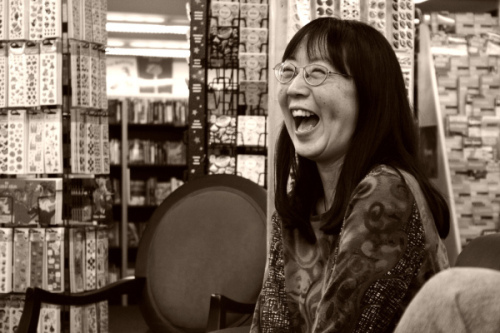 14 Responses to Interview with Debbie Ohi and Giveaway! Thanks for a great interview. Would love to win your book to learn about humor in picture books. 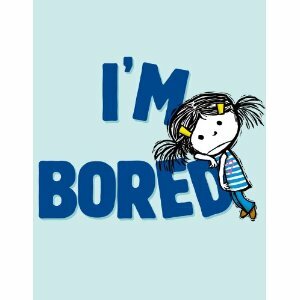 Even the title I’m Bored is funny. Very funny interview, thanks! The illustrations are wonderful throughout and the book looks like a hoot. Please enter my name for the chance to win. 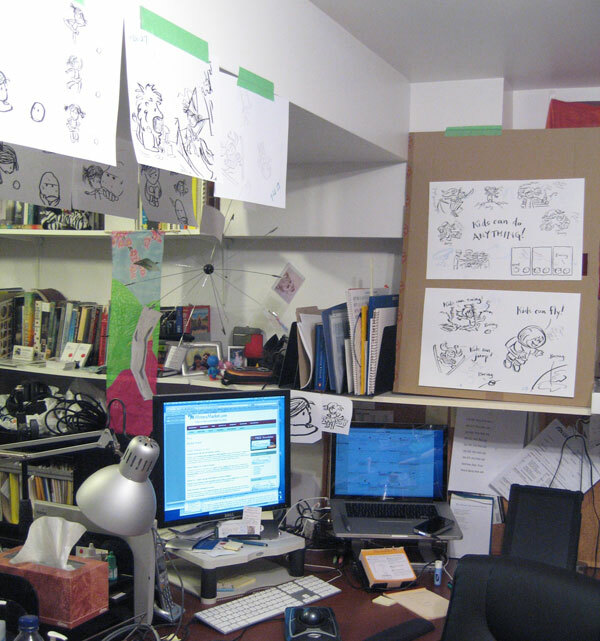 I love hearing how other writers work, and when that’s mixed with illustrating–wow! I visualize books but never have specifics in my head in order to illustrate them (or the talent, mind you). I’ve seen many Inkygirl illustrations on the blogosphere. It’s a pleasure to meet the artist behind it. Thanks so much for interviewing me, Christy! Rita: Thanks so much. 🙂 Glad you like the title, too! Barbara: Glad you found my interview interesting. Thanks for posting! It was so great to have you Debbie! Thanks for stressing that it’s HARD. I deal with a lot of beginning writers who expect to write a few PBs and rake in the chips. I wonder: would they WANT it to be so easy? There’s enjoyment and love in the challenge. What talent to both write and illustrate. Great interview. I loved the trailer, and of course, Debbie’s picture is just so full of mischief, I am not surprised at the humor in her books. Please don’t enter me in the drawing, since I already won Danette’s book. *snort* As I was reading this post, my 12 yo, who wasn’t looking at the computer screen, said, “I’m bored!” Yeah, like I haven’t heard him say THAT before. I would LOVE to win this book. I love Debbie’s drawings. What wonderful illustrations! I’m so envious of those people who can draw, but I can imagine how hard it is to write/ draw a picture book. Yikes!